One of the biggest steeplechases in the racing calendar will take place on 9th April at Aintree. It's the Grand National which is one of the most gruelling four-and-a-half mile races. It's the time of year that you will see plenty of women entering the bookies to place a bet. The first 'Official Grand National' was in 1839 however, the race was first run three years earlier in 1836. In the record books is Red Rum who won the race 3 times and is the only horse ever to do this. Red Rum won in 1973, 1974 and 1977, You can watch him beat "Crisp" in one of the most exciting finishes in 1973 here. Good luck if you have a flutter. I just found out that Paddy Power are paying each ways on first 5 places. Generally it is onlly the first 4 for each way bets. Today is the day for the biggest race of the year and I've been doing a bit of nosing around at my favourite tipster who shall remain nameless. Whichever horse you pick, I wish you luck. 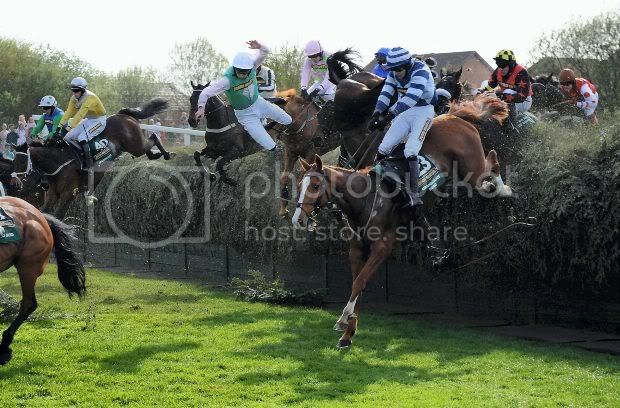 Two fences were withdrawn from the race on the 2nd lap as one horse was fatally injured at each of the two fences. Very sad news that two horses lost their lives in this race. Safety is being reviewed at the Grand National after two horses died after the race due to the searing heat and hard ground. Even the winning horse Ballabriggs was too tired to be ridden into the winner's enclosure after completing the race in just nine minutes and one second, the second fastest ever. He was taken straight to his stables. Protest group Animal Aid has called for the event to be banned, saying it is "on a par with Spanish bullfighting". The incredible speed at which the horses race increases the chance of injuries. Only 19 out of the 40 horses competing actually finished the race, with some falling, others unseating their riders and others being brought down by other fallers. Ornais was one of the horses that died, falling at the fourth fence and breaking its neck. Dooneys Gate fell at the sixth, breaking his back. Winning horse Ballabriggs had to be given oxygen and cooled down with water after the race. Rider Jason Maguire had to enter the winner's enclosure on foot. Animal Aid director Andrew Tyler said: "When horses are killed at the Grand National meeting, their deaths are not accidents but entirely predictable. The public has been conned into believing that the Grand National is a great sporting spectacle when, in reality, it is straightforward animal abuse that is on a par with Spanish bullfighting." The BBC was also condemned by animal rights groups after its commentator Mick Fitzgerald described the dead horses as "obstacles". "When a horse gets hurt, everyone is deeply upset," said Julian Thick, managing director of Aintree racecourse. "Safety is the first priority for the organisers of the Grand National meeting and we will redouble our efforts to make sure that everyone involved in the event – the horses, the jockeys, the spectators – is able to participate in safety and comfort." But this is terrible. Horses dying??? Is this a common occurrence for this sporting event? Yes it is sadly. It's the toughest steeplechase of them all and the fences can be low on the side they jump from and have a huge larger drop on the other side (and vice versa) which the horse cannot of course see.